when you look at the Julia Orsini Art of the Cards thread where I posted 13 card meanings from the 78 page booklet and aasisted by Editions Dusserre booklets. 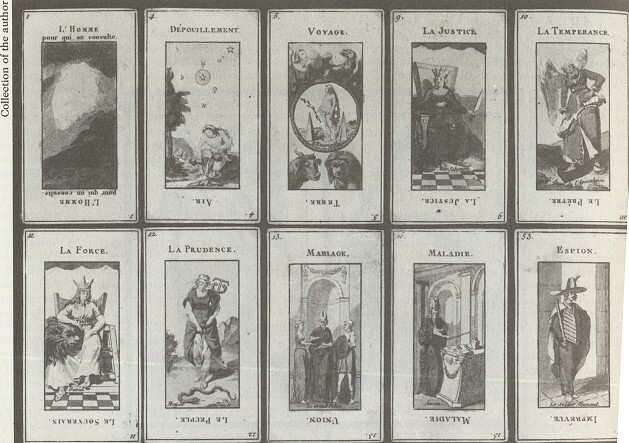 Although I would look at the Papus Divinatory Tarot (Aeon Books) for pictorial reference and general meanings, the Editions Dussere booklet was closer. Not exact, as additional cartomancy info seems to appear, different than my Lismon Etteilla. If no one links you to the thread that I described, I will try to find a computer and a bit of time in the next few weeks. Sorry the Android mobile phone app I have is a one-fingered type pad. Would it be this thread? Card meanings posted on first page. I haven't gone through all the thread though, so there may be more. Sorry. it has one post for each meaning, not a list in in a discussion...sorry,. That's not a Lenormand thread - the Lenormand is an oracle ! Thanks for saving me some work, Ptah. Interesting ideas, Huck. I need to correct something I wrote in my previous post. 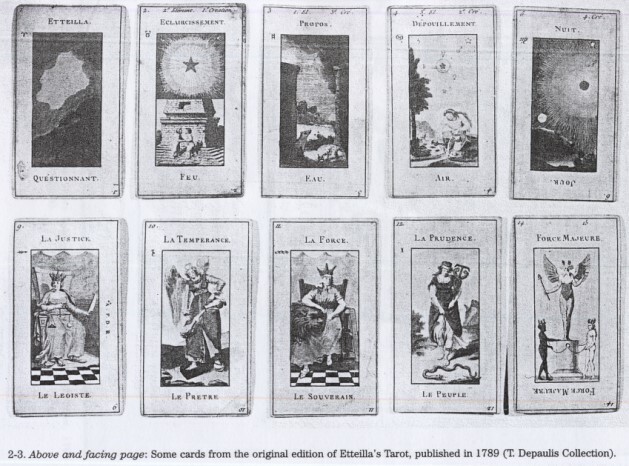 Reading further in Decker et al, I see that the 1789 cards (which they prove to my satisfaction really were designed by Etteilla and not some follower) did have the astrological correspondences on them. They do not say what they were, but you can see the signs on the cards they reproduce (below). They are Aries, Taurus, Gemini, Cancer, three I don't recognize, Aquarius, and Pisces. Three are missing, the 5, 7 and 8. So the cards are just as Mary says. The Ace to 10 of Coins--cards nos. 77 to 68--are associated with the Sun, Mercury, Venus, the Moon, Mars, Jupiter, Saturn, the head of the Dragon, the tail of the Dragon, and part of Fortune respectively. This is exactly as Mary's list has it. Decker et al also give correspondences to the Marseille trumps for this deck. Oddly to me, it is not quite the same as the list they gleaned from the 1783-1785 "cahiers." Number 1, previously correlated with the Pope, is now correlated with the Popess. Number 6, previously correlated with the Empress, is now correlated with the Emperor. Number 7, previously correlated with the Emperor, is now correlated with the Pope. And number 8, previously correlated with the Popess, is now correlated with the Empress. Here are the two lists, scanned from Decker et al, pages 86 and 92. I have placed the two tables side by side for ease of comparison. The Fool, however bears the number 0, and does not really have a number at all; it comes between cards 21 and 22, that is, after the trump cards and before the suit cards. So for the date 1789, it would appear that Mary's list of correspondences to the Marseille is wrong (to the extent that describes Etteilla rather than Papus) for his 1, 6, 7, and 8--or at least inconsistent with Decker et al. For 1785, it is right, except for the one correction (for number 1) and one addition (0 for the Fool). However Decker et al do not say where in the cards or accompanying brochure these correspondences come from. I hope they do not come from Grimaud in the late 19th century, which they also discuss immediately prior to giving their 1788 list. Now I have another question. 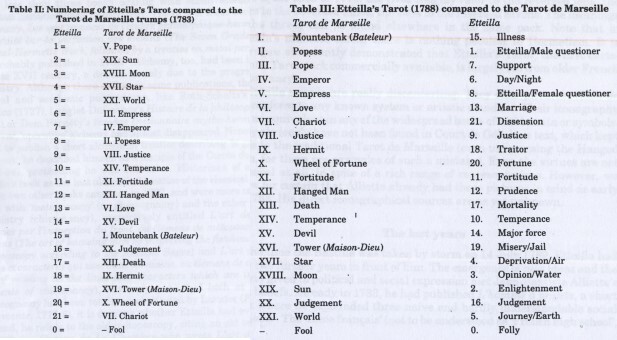 Are these correlations between astrological signs and tarot cards the first known in recorded history? It would seem that they are. And perhaps even the first in unrecorded history. If they had been part of a tradition, even an oral one, Etteilla surely would have mentioned some sort of astrological connection before 1785. I have spot-checked the two books of his they I find on-line, and I see nothing in them about astrology at all. Some of his followers seem to have continued the astrological associations and some not. From Hugand we have a "..recreations astrologiques par le livre de Thot" of 1791 (Decker et al p. 102f). From D'Odoucet 1792 we have a Science des signes, ou medecine de l'esprit, contenant: 1: L'intelligence des sciences numerique et astrales des premiers Egyptiens... (Science of signs, or mind medicine, containing 1. The understanding of numerical and astral sciences of the first Egyptians...). I find it interesting that the word-lists were understood as containing homonyms as well as synonyms. That was a feature of 15th century Italian "hieroglyphs" as well, to include homonyms as part of the interpretations, if I remember correctly (I will try to look that up). It is also interesting that "Julia Orsini" in c. 1838 doesn't mention astrology at all. 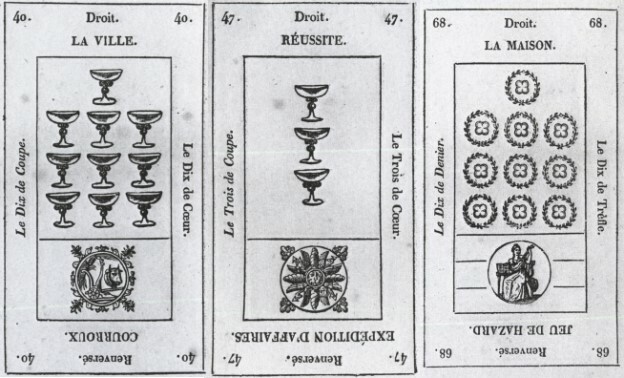 The cards are not identified with particular signs, either in the text or on the cards, although there are astrological signs within the illustrations, notably 4, 5, and 6. However the book does have one intriguing illustration of the "Temple of Memphis," where, of course, Etteilla said the cards and their symbolism came from. The text does not, as far as I can see, discuss this illustration. 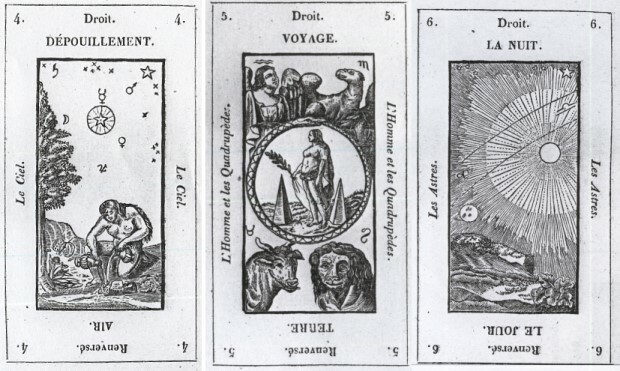 Looking elsewhere, I find no discernible astrological symbolism in the "c. 1800" Etteilla deck that Kaplan reproduces (Vol. 2, p. 400), comparable to that on the 1789 deck in Decker et al (below;Decker et al, p. 145, argue convincingly that the deck is actually 1826, because it the box advertizes a book published in that year). I do find the same symbolism on card 4 that we find in 1838, but it is not on card 5. There is also no such symbolism that I can see on Kaplan's King and 10 of Coins in the same deck (below), although the latter has a reference to the Pythagorean tetrakys. (Unfortunately, Decker et al do not give us any Coins.) In Cups, I think there is a reference to the first triangular number, 3, as well as to the second, 10. By this time, as we see at the end of the row, the Fool has been made card 78. The designer, "Lismon," has discarded the Pythagorean triangular patterns. Nor do I find any Pythagorean concepts discussed in the text. I am not sure when astrology got associated with tarot again, after 1792. I see nothing in Decker et al before Paul Christian, 1863. And I know nothing about the consciousness of Pythagoreanism after Etteilla, except that "Lismon" and "Julia Orsini" seem not to have any. ...Certainly there ar no astrological/tarot card correspondence charts or anything like that. So Hallbron's book wouldn't help you anyway. "Ayant le livre de Thot dans les mains ou si l'on veut le jeu de Cartes nomme Tarots, & ayant cotte les feuillets com je l'ai dit dans le Cahier qui precede celui-ci, if faut ecrire ou se ressouvenir que foru le No. 1 doit etre Le Belier & represente la tete de l'homme". He goes on the link the rest of the zodiac with the next 11 cards. It's these correspondences that appear in the modern Grimaud Grand Etteilla LWB. Again, thanks for saving me some work. Since I do not have a modern Grimaud Grand Etteilla and don't know what "LWB" stands for, I assume you mean that the zodiacal correspondences are the same as in Mary's time-line. But he doesn't in 1785 yet have the planetary correspondences in the suit of Coins. Is that right? I am also confused by his description of No. 1 as representing the head of a man (or the man). I see no head of a man on that card, unless it is the shape formed by the contrast between light and darkness. What does Etteilla mean? Is he speaking of the visual shape on the card, or of what it symbolizes. And is that "head of a man" what connects the card to the Pope of the Tarot of Marseille or to "Etteilla" and "Questionnant," the 1789 keywords on the card? and Bernice posted the link to the first 13 cards descriptions from the Lismon Art of Drawing the Cards I did in your Etteilla in Las Vegas thread. The Lismon 1890 and Grimaud 1910 have number one as the male consultant or masculine enquirer card. I hope that makes sense. 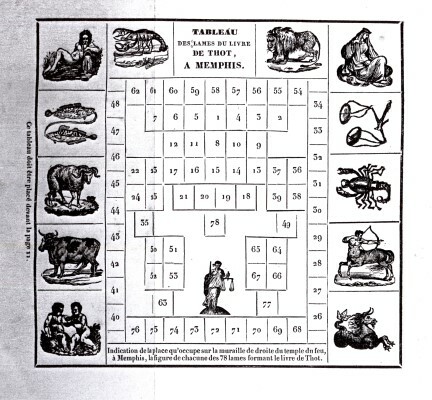 According to the 3rd 'cahier' of Etteilla's book "Manière de se récréer avec le jeu de cartes nommées tarots" (1783), of which I have photocopies, No. 35 (Ace of Batons) means "Naissance", and when reversed, "Se défier de la premiere victoire". These are the same as the meanings given in Edition Dusserre's booklet of "GRAND ETTEILLA" deck (p.11 & 14). Meanwhile, the same booklet gives the opposite meanings (Upright "Chute" & Reversed "Naissance") to the No.35 card at p55, which is included in the section most probably derived from "Dictionnaire synonimique du livre de Thot". So, I suppose Julia Orsini followed this "Dictionnaire synonimique" rather than D'Odoucet.